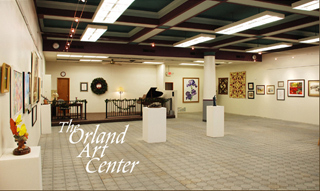 The Orland Art Center occupies the entire first floor of the handsome three story Orland Laurel Masonic Lodge building. 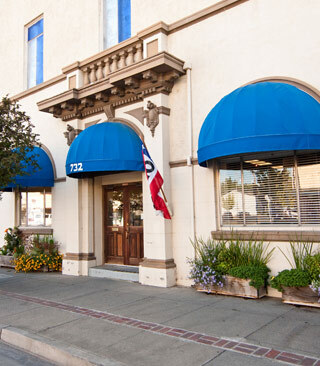 Originally built in 1913, this historic building is located at 732 Fourth Street, in the heart of downtown Orland, five minutes from the 1-5 freeway. The Art Center is funded and managed by the City of Orland Arts Commission. We are particularly proud of our spacious 2500 square foot gallery space. It features a beautifully carved ceiling, wonderful 12 foot high display walls, and stately columns that add to the Gallery's elegance. Unique flooring softens the sound in the room, and encourages visitors to enjoy quiet conversation as well as the artwork on display. State of the art gallery lighting enhances the monthly exhibits, which feature Fine Art created by local, national, and internationally recognized artists. On a dais at one end of the Gallery, is a lovely baby grand piano, which allows for fine live music during Artist's Receptions and other Arts Commission events. The Art Center also provides weekly figure drawing sessions, professionally taught art workshops, children's art classes, and educational lectures and seminars. This is truly one of the finest art centers in the entire northern California area. We invite you to visit and enjoy it with us. Surrounded by rich farmland, just a fifteen minute drive from the Black Butte Recreation area, the Orland community is rightfully proud of its "state of the art" Gallery and Art Center. during the duration of each show.